George Kenneth (“G.K.”) Butterfield was born on April 27, 1947 in Wilson, North Carolina. He earned a BA in sociology and political science at North Carolina Central University (NCCU) in 1971, and a JD at the NCCU School of Law in 1974. He was strongly influenced by one of his law professors, Harold Washington Jr., who later became the mayor of Chicago. After completing his education, Butterfield worked as an attorney with the law firm of Fitch, Butterfield and Wynn from 1975-88. He then served as a judge in North Carolina Superior Court from 1988-2004. In a July 2004 special election, he won a seat representing North Carolina’s 1st Congressional District in the U.S. House of Representatives—replacing Rep. Frank Ballance, who had resigned in June. Butterfield was again victorious in the regularly scheduled general election of November 2004 and has been reelected every two years since then. He is a member of the Congressional Black Caucus (CBC). When the House of Representatives voted by a 345-75 margin to defund the notoriously corrupt community organization ACORN in September 2009, Butterfield was one of the 75—all Democrats—who voted to continue funding the group. In November 2014, Butterfield said that a crime “probably was committed” three months earlier by the white police officer who had shot and killed a violent black criminal named Michael Brown in a Ferguson, Missouri altercation that subsequently set off weeks of protests and rioting. Moreover, the congressman warned that if the grand jurors who were examining the evidence pertaining to that case were to “turn their backs on justice” by not indicting the officer, “there will be pushback from those who are concerned about it—and I’m one of those who’s concerned about it.” “And I would hope,” he added, “that law enforcement would not inflame citizens who want to express their First Amendment rights” by protesting. The following month, Butterfield and Rep. John Lewis led a number of fellow CBC members in urging President Barack Obama to invite the families of Michael Brown and Eric Garner—another black man who had died in highly publicized confrontation with a white police officer in the summer of 2014—to his upcoming State of the Union address in January 2015. In January 2015 as well, Butterfield objected strenuously when Republican House Speaker John Boehner—without first asking President Obama for his approval—invited Israeli Prime Minister Benjamin Netanyahu to speak to Congress on March 3rd about the gravity of the growing Iranian nuclear threat and his “profound disagreement” with the deal that the Obama Administration was pursuing with Iran. Butterfield was one of numerous CBC members who announced that because of Netanyahu’s act of “disrespect” against Obama, they would be boycotting the speech. 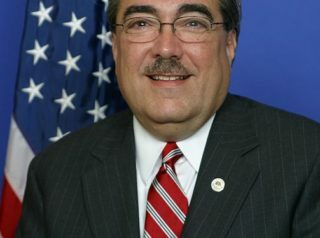 That same month, Butterfield praised Loretta Lynch—whom President Obama had recently nominated for the post of Attorney General—as someone who could be depended upon to “not only … enforc[e] the laws of the land, but also to [address] issues that are unique to the African-American community, such as police misconduct and the need to reform the criminal-justice system.” Meanwhile, the congressman expressed outrage over the fact that Republican Senate Majority Leader Mitch McConnell had been postponing a confirmation vote on Lynch because of disagreements with Democrats over a human-trafficking bill that the Democrats were blocking. By Butterfield’s telling, “race certainly can be considered a major factor in the delay.” As evidence, he cited the fact that Ash Carter, a white man whom Obama had nominated for secretary of defense, “was confirmed in literally just a matter of hours.” In a similar vein, Butterfield rejected Republican Senator Rand Paul’s contention that he (Paul) opposed Lynch’s confirmation because of her support for civil asset forfeiture, a legal process by which law-enforcement officers take assets from suspected criminals. That was “nothing but an excuse to keep an African-American legal scholar from holding this high position,” said Butterfield. In November 2016, a Daily Caller reporter asked Butterfield, as the latter was walking to his car, to comment on Minnesota Rep. Keith Ellison‘s past calls for the creation of a separate black nation in the Southeastern United States. Butterfield responded, “I have to find out if he said it. It doesn’t sound like Keith Ellison to me.” When the reporter informed Butterfield that Ellison had indeed once written an article advocating precisely that position, Butterfield said that he had to go and climbed into his car. For an overview of Butterfield’s voting record on a range of issues during his years in Congress, click here. For additional information on Butterfield, click here. Further Reading: “G.K. Butterfield” (Votesmart.org, Keywiki.org); “Food Should Be Out of the Conversation” (by G.K. Butterfield, 7-12-2012); “Congressional Black Caucus Chairman Hopes Ferguson Grand Jury Finds Evidence of a Crime” (PJ Media, 11-21-2014); “Black Lawmakers Want Brown, Garner Families Invited to State of the Union” (Politico.com, 12-5-2014); “CBC Members Mark MLK Day in Ferguson with Vow to ‘Use Our Positions to Expose Racism’” (PJ Media, 1-19-2015); “The Politics of Democrats Skipping Netanyahu’s Congressional Address” (National Review, 2-9-2015); “Cong. Black Caucus Chair Wants Dems to Focus More on Poverty, but Doesn’t Oppose Amnesty” (Breitbart.com, 2-24-2015); “Congressional Black Caucus Chair: ‘Donald Trump Is a Disgusting Fraud’” (by Pam Key, 9-16-2016); “Black Congressmen Refuse to Condemn Ellison’s Past Proposal for a ‘Black State’” (Daily Caller, 11-30-2016). “Police, Race Key Issues for Loretta Lynch as AG” (Newsmax, 2-9-2015); “Black Caucus Chair Says Race Maybe a Factor in Loretta Lynch Vote Delay” (Newsmax, 3-17-2015); “CBC Targets McConnell with Racism Charge” (National Review, 3-18-2015); “Congressional Black Caucus Chairman Says Rand Paul’s Opposition to AG Nominee Is Racist” (National Review, 2-6-2015).